Another travel post, about a fun little city trip! Last weekend of November I spent 4 days in Dublin. I stayed in a cool little hostel (Spire Hostel) which not only was the cheapest in whole Dublin but simply had the most amazing staff working there. As I arrived quite late in the evening I dumped my bag at the hostel and immediately went for some fish & chips. It simply seemed the most straightforward way to start off my little journey. I have been in UK before but for some reasons I forgot that vinegar is the condiment of choice when eating chips. After remaining a bit skeptic I doused my fries in acid. Actually that was really good! 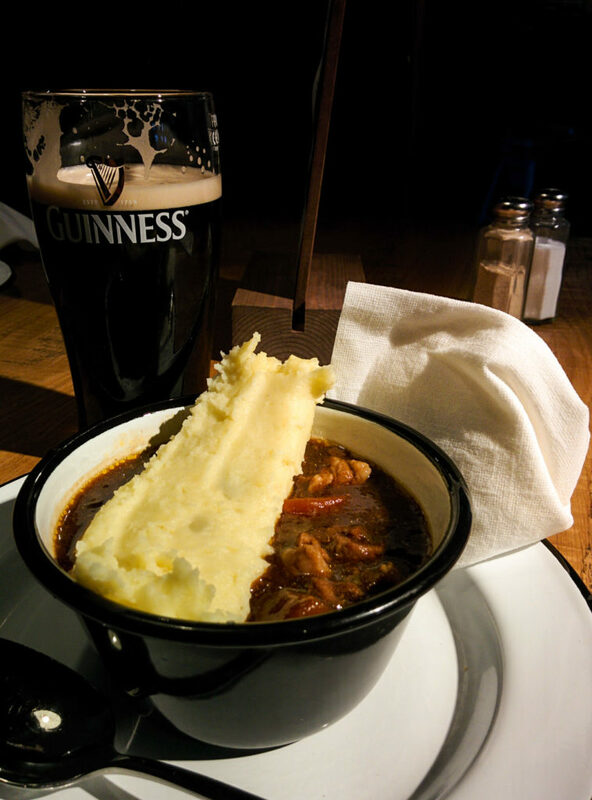 Put some flaky cod next to it as well as some Guinness: Yes, I’ve officially arrived in Ireland! 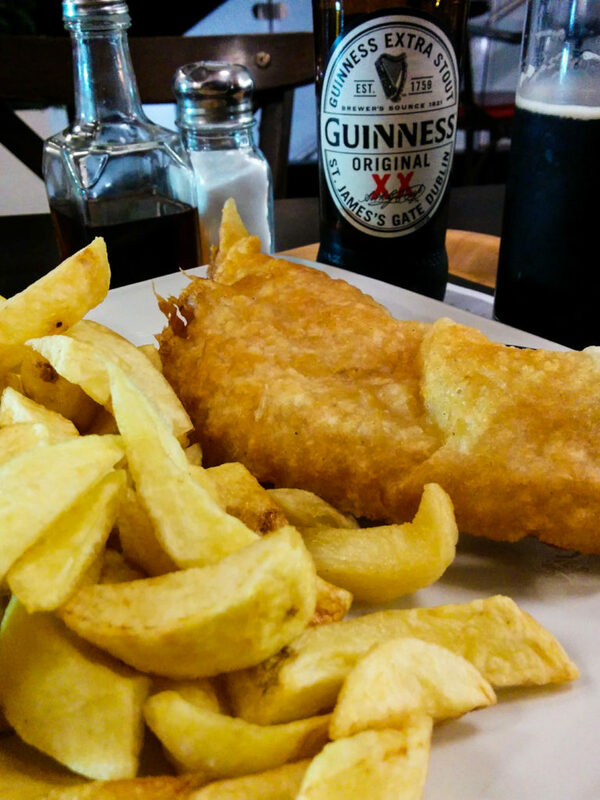 Flaky battered cod, crispy chips, way too much vinegar and some of the ‘black stuff’. Welcome to Ireland! After getting some breakfast at the hostel I went to the Little Museum of Dublin. A nice little place that is purely filled with donated personal items of Dubliners. It gives you a snapshot of the life during the last decades and the guide told our small group (just me and a film extra that supposedly met Mel Gibson the day before) all about the struggles of the country. 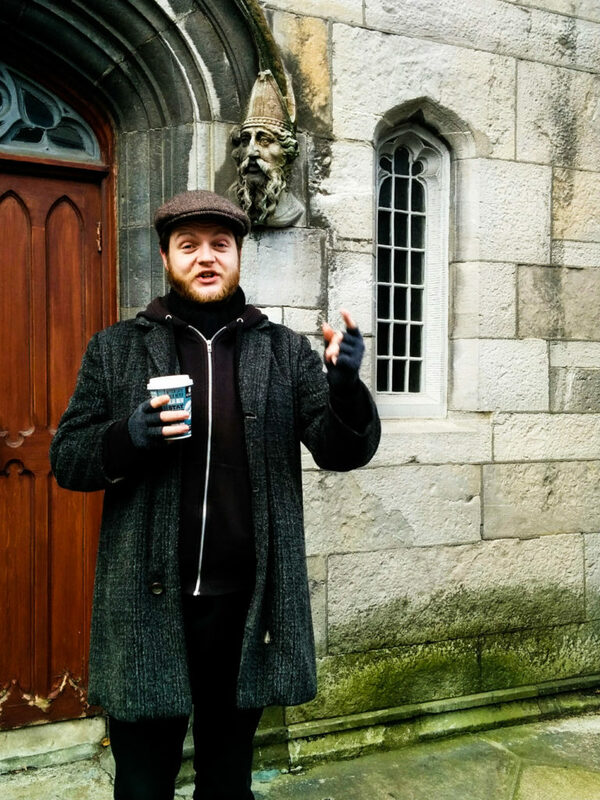 To see a bit more of the city I joined the free Dublin walking tour. Our tour guide Ian looked as Irish as can be and the two Australian girls in the group almost peed themselves when Ian started talking in his proper Irish accent. Ian showed us around and ‘took a p*ss‘ out of pretty much all buildings build by Irish architects. Amazingly funny guy! 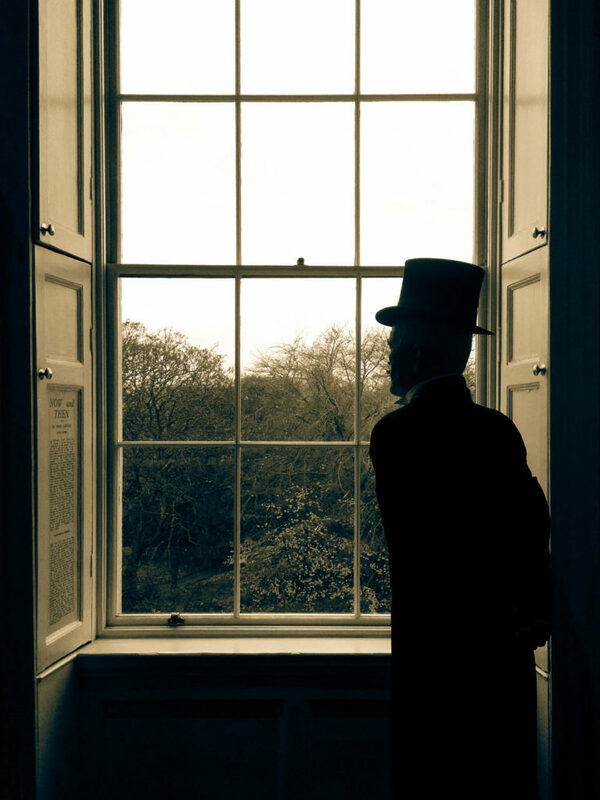 Make sure you take the tour when you are in Dublin. 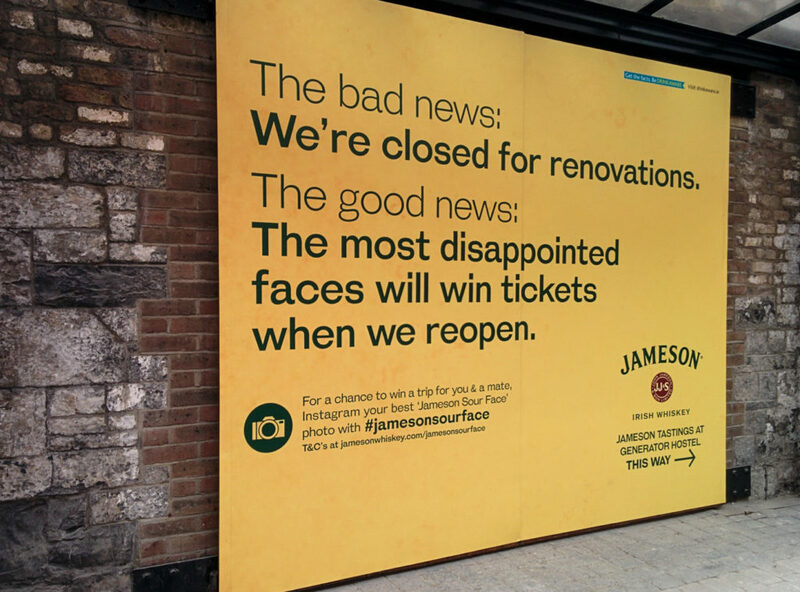 Luckily there’s more than 1 distillery in Ireland, well Dublin even. 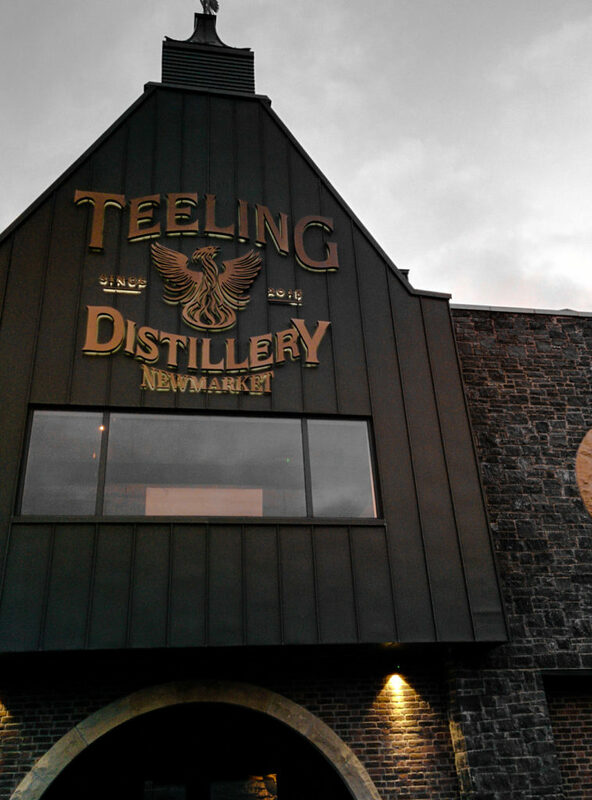 I went to Teeling’s afterwards, did the tour and obviously the whiskey tasting! Finally found a distillery that’s indeed actually open! 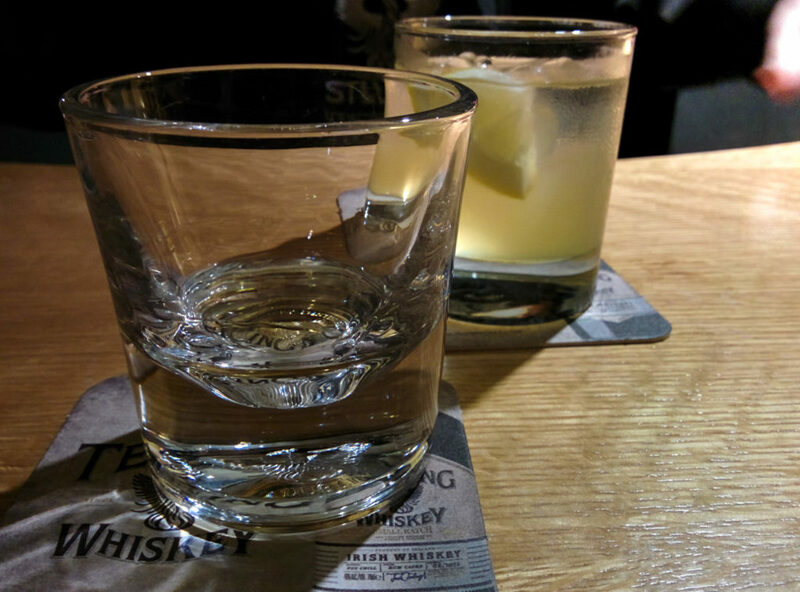 On my way back from Teeling’s towards my hostal, I walked by Yamamori Izakaya. A Japanese restaurant and bar with cocktails, sushi, finger-food and everything in-between. 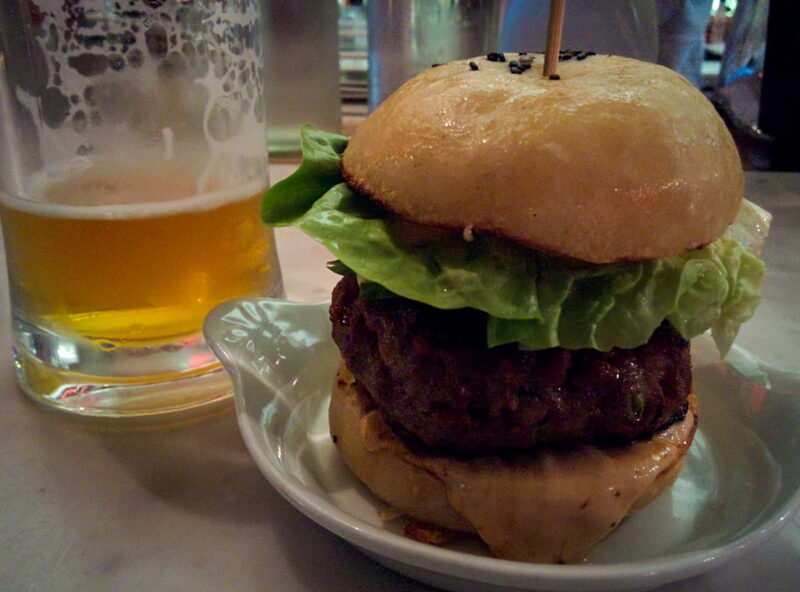 After being undecided between grilled pork belly and the burger I ultimately settled for the Izakaya burger. A succulent burger made from pork and beef with some kimchee mayonnaise on a steamed bun. I could swear I also tasted miso in the patty. Really good grub! Thick pork and beef patty on a steamed bun with kimchee mayo. Succulent and balanced! 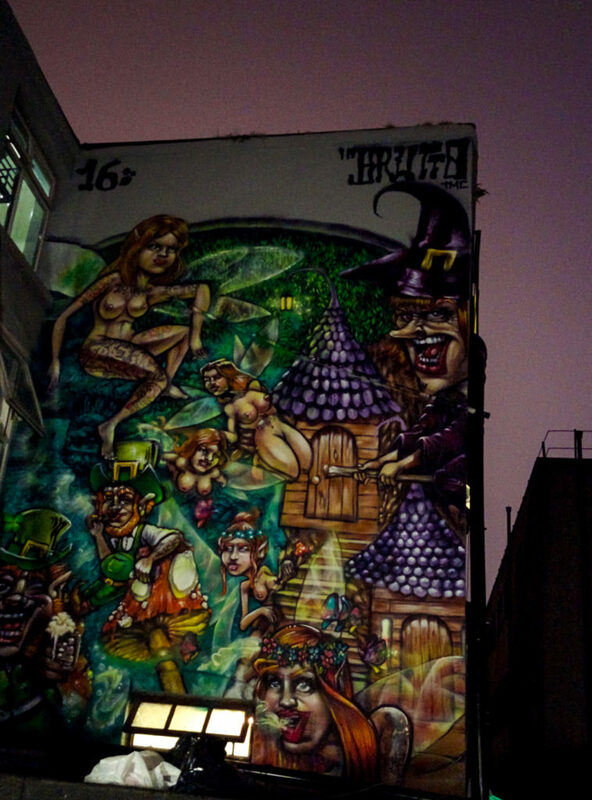 In the evening I went for the pub crawl. Good fun and lovely live music with singing, guitars, violins and lots of whiskey and ale. No photos. Some things should remain undocumented. Opening my eyes, everything hurts, no water, bad hangover. The bad aftertaste of a fun night out in Ireland. I carry myself into the city to a pub called Slattery’s and ask the waitress what she can do about my hangover. 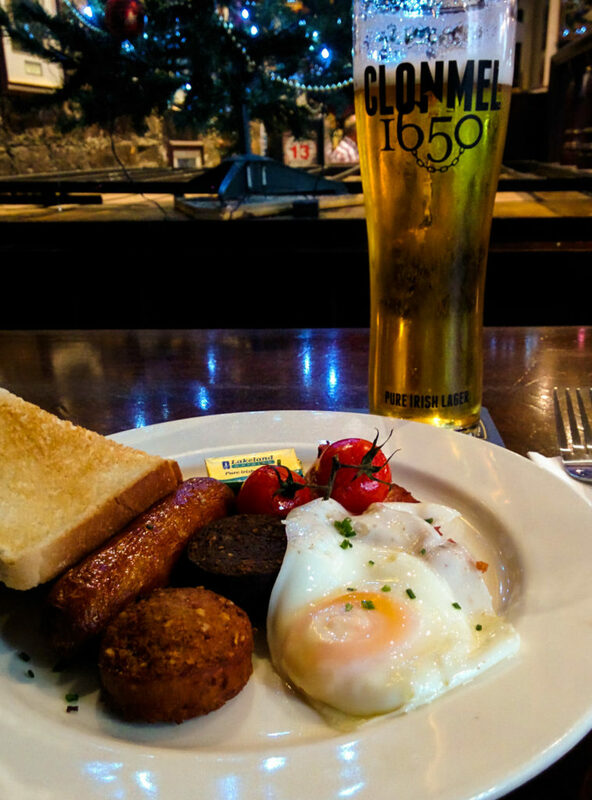 With a smile she recommends the big full Irish breakfast and a pint of Clonmel – a lager that goes down really smooth and will make the hangover melt away – she was talking from experience. Apparently Anthony Bourdain went here for his program ‘No Reservations’ and only had good things to say about the breakfast. Well, if it’s good enough for Antony I’m more than willing to give it a go! Black pudding, white pudding, bacon, sausage, sunny side up, toast, loads of butter and some cherries (mostly for color I guess). Yes, that hits the spot! Hatch and Sons is a place renowned for their all day brunch menu. People sit here for hours shoving little tasty morsels into themselves. The place was way smaller than I thought and completely packed. I was lucky enough to get the very last table. When in Ireland you should eat scones, so that’s what I ordered. 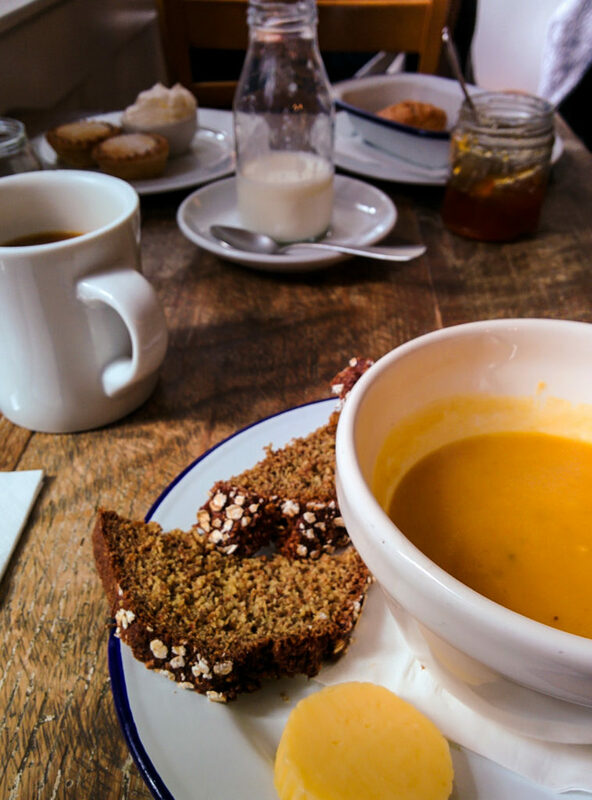 Oh yes and next to that some coffee, curried sweet-potato soup, tasty sourdough bread, two little mince pies and more fresh butter (which was to die for). The table was filled with food. Did I mention I went there alone? Rest of the day I was walking around the city. I was planning to go out tonight again, do another pub crawl, since it was my last night in the city. When I arrived back at the hostel I asked Olga, the polish girl at the reception, when the pub crawl would begin. She said about sevenish, but that I could just as good stay at the hostel as they’d have free drinks in the evening. Wait, what? Free drinks in a hostel? That’s a first! 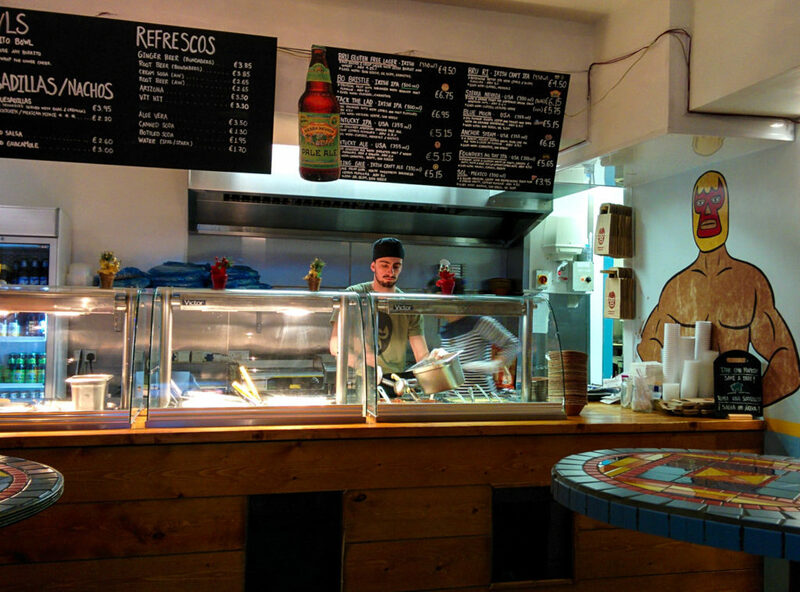 Pablo Picante – Pablos promise: Daily fresh, no freezing, no frying, no microwave. So good! But before that a little dinner first. 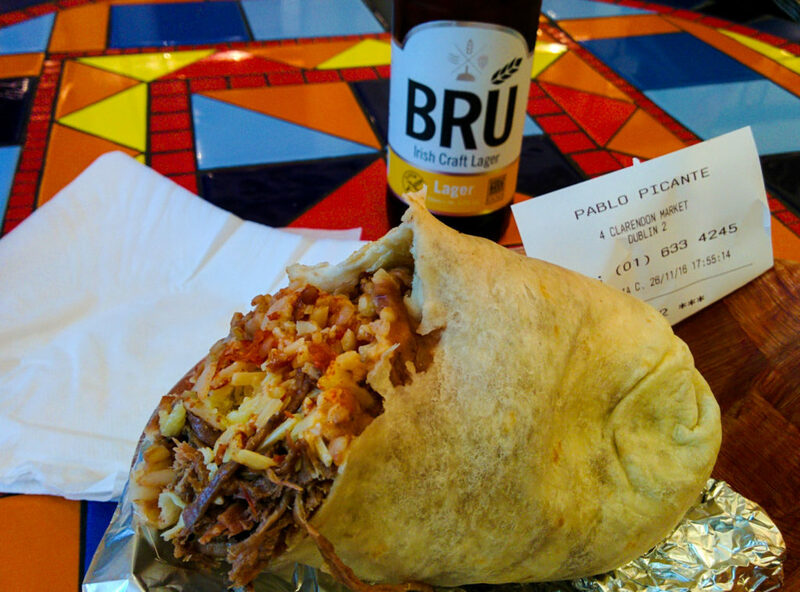 I read about Pablo Picante – a Mexican restaurant that makes awesome burritos. That thing was packed with shredded beef, beans, Mexican rice, cheese and a salsa of your choice. I went back to the hostel and was indeed greeted with free sangria and free beer. That night I met some really cool people. The whole staff of the hostel is just incredibly friendly. When asking the owner of the hostel why he’s handing out free drinks, his response: “Just to get people together”. That’s what I call full service! Had a great time and hang out with the staff till the end of night. One of the people I met the night before was Jaewon, a South Korean girl working in the restaurant business and with her husband working as a chef we had a lot of food to talk about. We met again the next morning during breakfast and she told me she was going to the Guinness brewery. I’m up for that. We went there and that place is huuuge. Of course we both got our Guinness pouring diploma’s (I have to put that on my CV) and went for some Guinness infused beef stew in the restaurant. I still had a bit time to spare so we went to the whiskey museum afterwards. 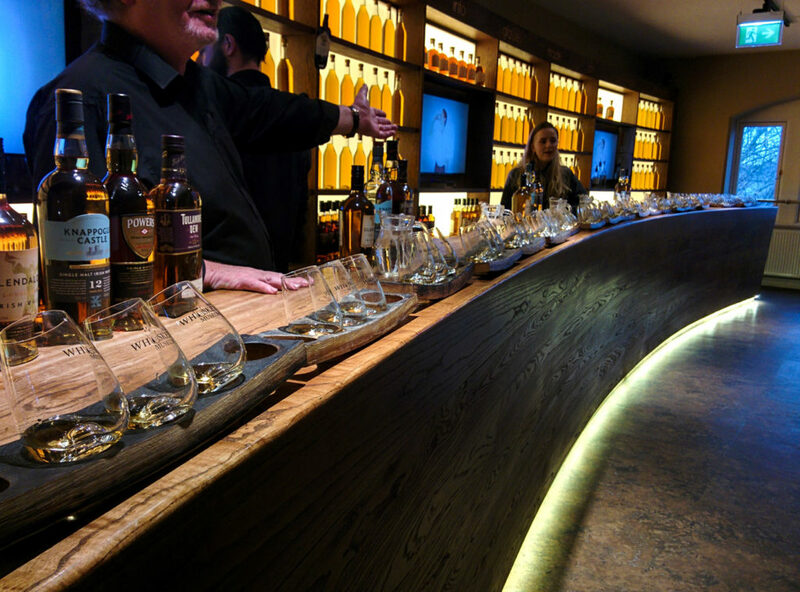 The tour was cool and was obviously followed by a whiskey tasting. I kind of forgot time at that point and had to hurry quite a bit to catch my flight back home to Amsterdam. All in all I had lots of fun, met so many nice people and will definitely be back to Dublin shortly. Thanks Anna, JayJay, as well as Olga, Joab, Matheus and all the other staff from the Spire hostel for an amazing time in Dublin! Whenever you are in Amsterdam, make sure you give me call and I’m more than happy to return the favor!